PDQ (Pretty Damn Quick) is an open source software package that supports the constuction of queueing models for calculating performance metrics associated with the management of data centers, packet networks (e.g., Internet traffic), cloud applications, manufacturing supply-chains, and so on. PDQ works because, from the perspective of performance, all such systems can be regarded as a network of buffers where requests can wait for service when the shared resources are not immediately available. Since a buffer is just a storage area for multiple requests, when they are maintained in a certain order, they form a queue. The most common queue ordering is First-Come-First-Served (aka FIFO: First-In-First-Out). Since a buffer is just a type of queue, all of the above-mentioned systems can be represented as an interconnected network of queues. A PDQ model calculates all the performance metrics associated with such a network. 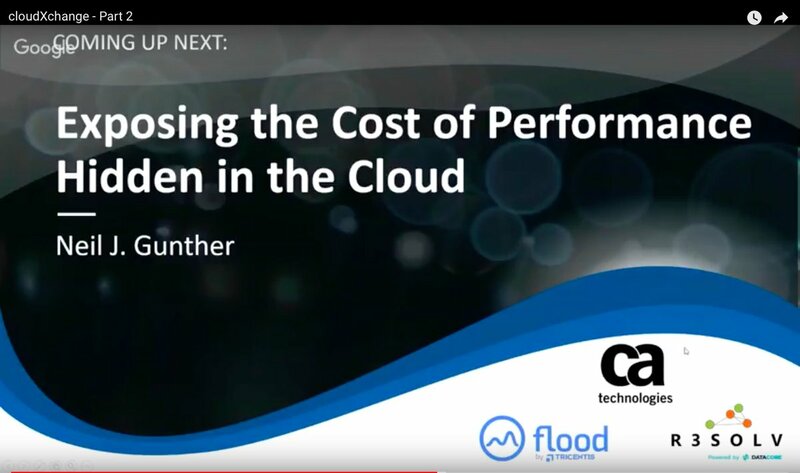 A very pertinent example of applying PDQ to assess the most cost-effective Auto Scaling policies on AWS cloud was presented at the recent CMG cloudXchange event and those PDQ models will be discussed at length in this workshop. The purpose of this workshop is to learn how to apply PDQ to your particular performance analysis and capacity planning projects. The GCAP and GDAT classes provide the general framework for collecting a variety of performance metrics and understanding the relationships between those metrics. Underpinning the Guerrilla approach is queueing theory and statistical analysis. This workshop focuses on applying that general framework to constructing a PDQ model (or models) to meet your particular needs. Classes typically begin at 9am and the instructor is generally available until 9pm each day. Many class discussions have been known to continue over dinner. Lunch is provided from Noon until 1pm. Entry level for newbies, e.g., Guerrilla Boot Camp (GBOOT), which is usually offerred on a demand basis only. Please contact Performance Dynamics if you would like to take this Level I class. Detailed study of a particular capacity planning technique or performance analysis tool, e.g., Guerrilla Data Analysis Techniques (GDAT). A printed certificate reflecting the level of achievement is awarded to each attendee at the completion of the respective course. Since this is a hands-on workshop, the structure and content are largely driven by you. This works best if you can bring to the workshop some kind of architectural diagram and, where possible, some relevant performance data. If you're not sure how to go about that, we can help you identify those things before you come to the workshop. The key to constructing a successful PDQ model is identifying the appropriate INPUT metrics (e.g., arrival rate, service times) as well as the expected OUTPUT metrics (e.g., queue length or buffer size, response time). In addition, a number of case studies will be presented to exhibit a variety of approaches to developing PDQ models. The good news, and a key feature of PDQ, is that even the most complex architectures end up having a shockingly simple representation in PDQ. Part of the reason for this result is that a model of performance is not the same thing as a model of function (which is what developers are required to focus on). Therefore, a lot of operational details, that one would normally expect to be important, don't matter. PDQ is available in several commonly-used programming languages and, for the PDQW workshop, you are free to use whichever language you prefer. 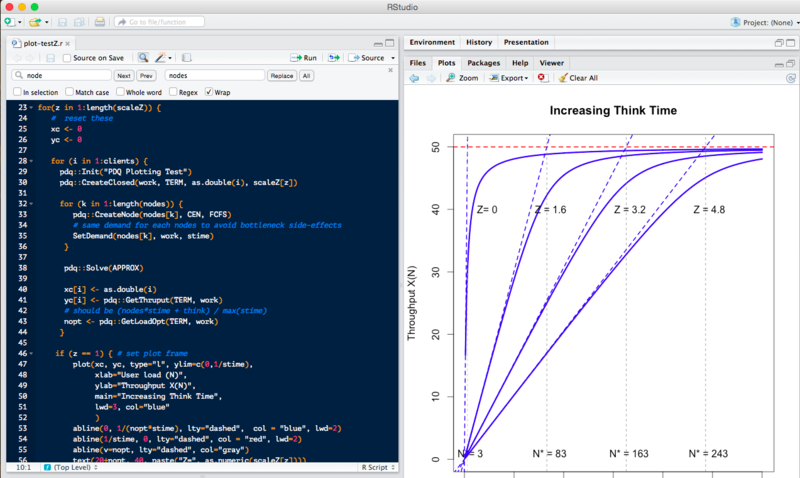 However, the instruction will otherwise be delivered using the R version of PDQ in RStudio. Clearly, this combination R and PDQ is particularly powerful for doing computer performance analysis and capacity planning. In this workshop you will learn the following. Other take-aways include the PDQ textbook as well as all the scripts presented and developed in the workshop. On 22 Sep 2018, 10:18.